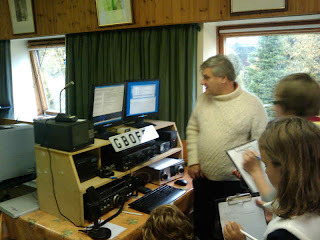 Amazingly, that's a whole year since the last Jamboree On the Air (JOTA) so last weekend it was time for it again. 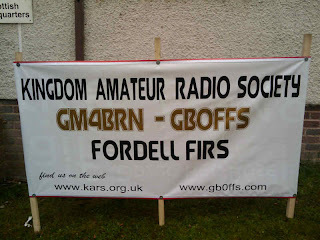 The event was organised by Fordell's resident amateur radio club (KARS) who had been busy during the week setting up the equipment and rigging up a few temporary wire aerials in the trees. Bases were set up in the reception building and Scottish Headquarters - this year there was a special website setup for the event which you can look at here. 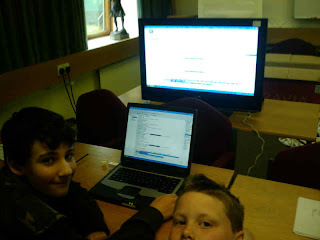 Above : Caught in the act...a couple of young scallywags try to hack into a US Military website during Jamboree-on-the-internet. As well as the JOTA, the KARS guys have also been helping the centre a bit by making up vinyl vehicle stickers for the centre land rovers. 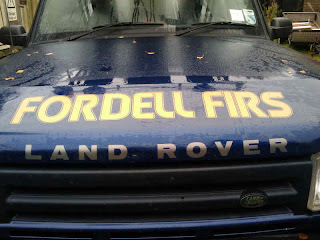 Both vehicles are now looking splendid with custom signs as you can see from the photo below. 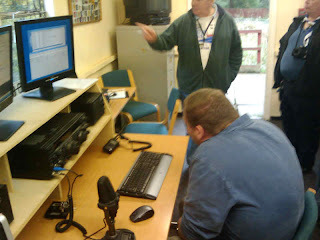 While the JOTA proved very busy, the rest of the site was fairly quiet in terms of activities and visitors. Most of the staff had decided to have a rare weekend off, apart from serial Fordell addicts Henry and Ali who weren't able to tear themselves away from the staffhut, cheap coffee and even cheaper food for even one weekend. Saturday was pretty quiet and sunday we had a visit from an combined stag and hen party (?!) who had heard that the challenge course was good fun and spent a couple of hours falling off beams, getting stuck in tyres and finally having a shot of the climbing wall. Excellent group and they all seemed to have a great laugh, even if a few of them found some of the challenge course obstacles a bit challenging. This weekend also looks like being quiet, next event coming up is (I think) the annual first aid course by Brian and June which we'll no doubt have some photos of here. 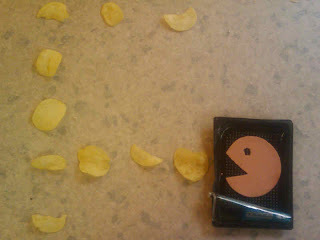 Above : Things to do in the staff hut when you're bored #421 - play Pacman with Quorn slices and crisps.